Haiti Information Project (HIP): FREE AND FAIR ELECTIONS IN HAITI! FREE AND FAIR ELECTIONS IN HAITI! FREE AND FAIR ELECTIONS IN HAITI! ONE PERSON ONE VOTE. NO TO STOLEN ELECTIONS IN HAITI. Haiti’s Presidential election, postponed from the scheduled date of Oct. 9th due to Hurricane Mathew, is now scheduled for November 20th, 2016. There can be no recovery unless there is a government in place that truly represents the people. The lack of such a government is why there was no recovery from the 2010 earthquake and why there must now be free and fair elections in which the people's voice is heard. If hurricane relief is separated from that, recovery will fail. 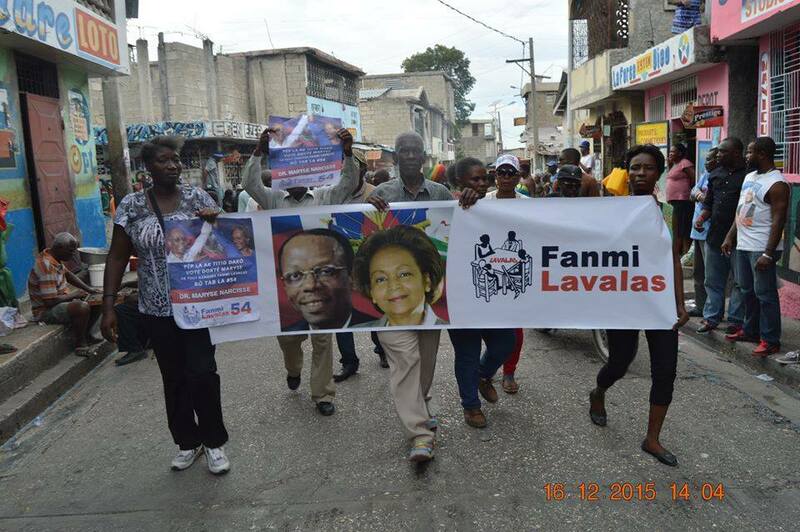 The Haitian grassroots have worked very hard for over a year, risking their lives to demand free and fair elections. As a result of their pressure, the 2015 electoral results were declared fraudulent. But there is concern that those who do not want to see free and fair elections are putting in place an apparatus of violence and intimidation, denying voters their electoral cards, and instituting sudden changes of polling stations to suppress the popular vote, steal ballots, change the vote count, and influence “election observers”. 1) Free and fair elections. 3) Stop US financing and other support for the terror campaign by a minority elite against the impoverished majority who are fighting for democracy in Haiti. 4) The new Haitian President must be installed by Feb 7th, 2017, in keeping with the Haitian Constitution. 5) Fair and unbiased reporting by the international press. Fanmi Lavalas, the political party and movement headed by Jean-Bertrand Aristide, is running a presidential candidate for the first time since the US-backed coup removed President Aristide from power in 2004 and excluded Lavalas from elections. Dr. Maryse Narcisse has been endorsed by President Aristide and they are campaigning together across the country, meeting huge enthusiastic crowds. Dr. Narcisse could become the first woman elected president of Haiti and the first since President Aristide to be chosen by and speak for the impoverished majority. She has traveled as part of Karavan Solidarite Fanmi Lavalas to areas hardest hit by the hurricane, assessing damage and bringing food, medical care, building supplies, drinking water and water treatment to prevent cholera, which was brought to Haiti by UN forces and has been spread by flood waters. The Haitian people, who mobilized for months last year, risking their lives to overturn rigged election results, succeeded in winning this new election round. They are determined that their votes will count this time and that every vote will be counted. After the vote, they will mobilize again to defend their ballot from interference. With the election rescheduled, people are protesting the end-of-January date for a run-off election. They say it would not allow sufficient time to install the new President by the Feb 7th date set by the Haitian Constitution, and they are demanding that the Feb 7th Constitutional deadline be met. The electoral council (CEP) is charged with organizing the elections, but they have a history of overseeing the massive fraud that has marred recent elections. There is also concern that if the CEP results are, once again, fraudulent, teams of “observers” headed by the OAS and other international bodies and their local counterparts will declare the results “legitimate” despite evidence pointing to the opposite. 1) The CEP is headed by Leopold Berlanger, a leading figure of the 2004 US-backed coup against democratically elected President Jean Bertrand Aristide. 2) The main 2004 coup leader and wealthy sweatshop owner, Andy Apaid, plays a central role as lead consultant in the CEP tabulation center where the votes will be counted and the results published. 3) The CEP under Berlanger's leadership has not implemented a number of recommendations of the Electoral Verification Commission, which was established in response to the massive fraud in last year’s elections. The CEP has allowed fraudulent parliamentary results to stand, favoring supporters of outgoing President Michel Martelly who was imposed by the US. 4) The CEP insists on quarantining a candidate's votes from a precinct where this candidate obtains 200+ out of a total of 550 ballots. Under the pretext of preventing fraud, perfectly valid ballots are eliminated from the count because a popular candidate is receiving “too many” votes. Officials of Fanmi Lavalas have been protesting this measure as it arbitrarily discards valid ballots in precincts that have large turnouts in favor of their candidates. Quarantined or provisional ballots end up not being counted and are likely to be destroyed. 5) A leading figure of the 2004 coup, Rosny Desroches, is in charge of the officially-designated election observer teams of 1,500 individuals. The media reports that funding for the observer teams came through the National Democratic Institute (NDI) in collaboration with International Foundation for Electoral Services (IFES). While the International Republican Institute (IRI) does not have offices in Haiti, it operates from the Dominican Republic through a number of existing organizations in Haiti. Both NDI and IRI are part of the U.S. government’s National Endowment for Democracy; the IRI was implicated in the 2004 coup and are known for funding interference, destabilization and other efforts to influence elections to impose US foreign and economic policies, including regime change. 6) It has been reported that the National Organization for the Advancement of Haitians (NOAH) is organizing an election observer team of 200 people. NOAH has worked closely with the Organization of American States (OAS) and the US State Department, both of which have been ardent supporters of fraudulent elections in Haiti. 7) The OAS, which is sending a team of observers for the November 20th election, has been thoroughly discredited in Haiti for its recent support of the massive fraud orchestrated by the CEP in 2015. The OAS record of support for fraudulent elections in Haiti includes its intrusive role in the 2010-11 elections that resulted in Martelly being imposed as president. The people of Haiti continue to mobilize for elections that are truly free and fair, free from ballot dumping and other blatant fraud which characterized the 2015 elections. The Haitian people are demanding: One person, one vote. Tout moun se moun. Every person counts.